Michael Redd made a rare appearance in Milwaukee last week, serving pre-Thanksgiving meals at the House of Peace on 17th and Walnut. Redd said the House of Peace charity was kind of tradition handed down to him by Ray Allen, which — though it’s great that Redd continues on with the charity — isn’t exactly true. His comments did bring back a memory of another Bucks team that went into a season with high expectations and started badly — worse even than this season’s frustrating 5-9 start. Let’s turn back the clock to November 2000 and the annual House of Peace meal. This, of course, is a true story. The House of Peace giving was something a lot of players on the Bucks did, and usually coach George Karl was doing the passing as far as who was going to go with him to serve Thanksgiving meals from year to year. In Redd’s rookie year (2000, when he was a practice player) Big Dog and Karl served dinners at the House of Peace. Dog and George came back from the event with a nasty flu bug that infected half the team and dogged the Bucks to a 3-9 start. Big Dog was so sick he missed a game. Karl, who was just as sick, did not. George stewed on it for a couple of days, and when Dog and Sam and Jason Caffey were dragging it a little bit during a road travel transfer (they were probably stoned), Karl blew up. Big Dog, still sick as a dog (but probably stoned) snapped back, starting a bunch of rumors that the Dog and George had stopped talking to one another. Dog and Sam were punished by having to start a game on the bench. This was also around the time that Ray and Big Dog were stripped of their co-captaincy and the “C” was sewn onto Ervin Johnson’s jersey. It was at that point that the 3-9 “Big Three” Bucks returned to Milwaukee for a few games and Big Dog went on a rebounding and scoring tear that ignited the rest of the team — those who could be ignited — some (like Ray, who never took criticism from George Karl very well) were still woozy with the flu (Dog and George, who had it first, got well first). But by December everybody was healthy, Ray’s head was clear and his shot was falling at devastating regularity and the Bucks finished the season out 49-21. The rest is crooked refereeing history. George has always taken credit for managing the 2000-01 team in such a way, just the right way, that made the magic possible. Karl deserves the credit. But in looking back at how the season started, and how and when it turned around, I can’t help but wonder close the Bucks were to imploding, and how easily Karl might have missed the connection, that magical NBA championship-worthy thing the Bucks had going in 2001. What if … Karl that November had served House of Peace dinners with a player NOT named Glenn Robinson? This entry was posted in Bucks History, Essential Reading, The Jinx and tagged Ervin Johnson, George Karl, Glenn "Big Dog" Robinson, Jason Caffey, Michael Redd, Ray Allen, Sam Cassell on November 25, 2010 by J.D. Mo. Strange Days for the Celtics So how does a team that went 37-45 in the regular season, the youngest team in the playoffs, shock basketball fans everywhere by deadlocking the best team in basketball 2-2 in the first round of the playoffs? The series that was the best excuse for going back to the bye system – remember the week off Nellie’s Bucks teams got at the end of each season – is now one of the more befuddling matchups in sports. And Joe Johnson, the Hawks shooting guard noticed only by Hawks fans at this year’s All-Star game, has arrived. Johnson scored 35 points last night, 20 in a Jordan-esque fourth quarter. The Celtics entered the fourth quarter with a 10-point lead, only to watch helplessly as Johnson and the Hawks outscored them 32-17 to take game four of the seven game series. In the process, Johnson made his coach, Mike Woodson, look like an offensive genius. Woodson simply isolated Johnson (at Johnson’s suggestion) one-on-one against Ray Allen, whose defense last night was about as soft as the defense he usually played when he was a Milwaukee Buck. Charmin soft. Textbook matador. After one driving Johnson basket in the fourth quarter, the TNT cameras panned to Celtics coach Doc Rivers, just as he was screaming, unmistakably, in all silent-screen actor obviousness, DAMMIT RAY!!! Not to let Rivers off the hook. Doc was thoroughly outcoached by Woodson. As Woodson’s Hawks formed their isolation set possession after possession, Johnson starting nearly at half court in one corner against Ray as the rest of the Hawks gathered along the opposite sideline, Rivers had no answer. He just left Allen to defend Johnson and all that open court by himself. “DAMMIT RAY!! !” was all he had. Rivers last night might have turned in one of the worst-coached games of the postseason were it not for Denver coach George Karl’s pathetic job all last week against the Lakers. (I digress). The only basket the Celtics scored in the first EIGHT minutes of the 4th quarter was a three-pointer by Ray Allen, easily the best Celtics player on the court in the final 12 minutes. Kevin Garnett and Paul Pierce looked like rec league players. Some of it was just bad, dumb luck – the Celtics worked hard for some good shots that, in the 4th, just rattled out. But great basketball teams make their own luck, and that’s where the Celtics fell short. (Nope, not gonna go for any of those hackneyed Irish cliches). Bucks fans watching the game had to wonder why Rivers left Sam Cassell on the Celtics bench until the final 1:30 of the game. Sam “I Am” will find a way for his team to score more than four points in eight minutes. The trick is to put him in the game and give him the ball. Even George Karl understood that. Come to think of it, any coach who has Kevin Garnett, Ray Allen, Paul Pierce and Sam Cassell at his disposal yet, minute after minute, puts the ball in the hands of a guy named Rajon Rondo, deserves all the trouble that Joe Johnson and the Atlanta Hawks can give them. “Basketball is a strange thing,” Cassell said after the game. “Strange things happen.” (Like another former Buck, Zaza Pachula, squaring off against future Hall of Famer Kevin Garnett). After last night’s game, I’m having a difficult time picturing the Celtics beating Lebron’s Cavaliers in the East semifinals – assuming the Celtics manage to get past the Hawks in this first round. George Karl, the overrated Having watched the Nuggets more than most NBA teams this season other than the Bucks, I’ve come to the conclusion that George Karl was absolutely full of it during his five years as coach of the Milwaukee Bucks, especially on defense. George Karl is no defensive coach. Karl’s Denver Nuggets, led by Allen Iverson, last night became the first 50-win team in NBA history to be swept out of the playoffs last night by Kobe and the Lakers. Karl’s greatest talent as a coach is to take supremely talented teams and make them playoff underachievers. He did it in Seattle (two surpise first round flops). He did it in Milwaukee in three mediocre regular seasons in five years. Now he’s done it in Denver. Not to lay it all on Karl’s doorstep. Allen Iverson and fellow guard J.R. Smith, who led the Nuggets reserves, were the only two Nuggets players who seemed to give a headband that their season was coming to an end. 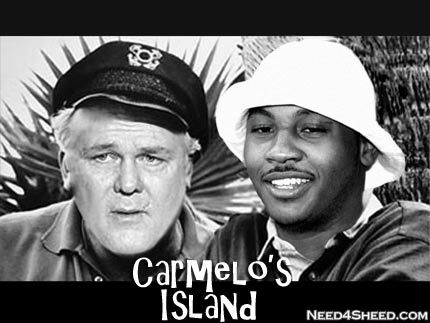 Carmelo Anthony’s looking round and melo – if he doesn’t lay off the potato chips, beer and weed, he’s going to turn into Antoine Walker. The disappointing West The ultra-competitive Western Conference has been anything but in the playoffs. With a few notable exceptions (game one of the Spurs-Suns series, which left the Suns demoralized), the Western matchups have been yawners. The vast majority of the great playoff basketball being played this year has come in the East. Cavs-Wizards has been intense. Pistons-76ers has been a war. The Hawks, again, the youngest team in the playoffs, have stunned everyone against the Celtics. The Lakers are as good as advertised, maybe even great. But the Dallas Mavericks, Houston Rockets and Denver Nuggets stumbled into the playoffs burnt out from the long regular season. Maybe 82-games is too many. Some of the older players just look tired (Jason Kidd, Marcus Camby, Kenyon Martin – 30 years old and two knee surgeries). Injuries have taken their toll (Houston). It’s no coincidence that the younger teams are beginning to emerge. The Orlando Magic, the Hawks, the Sixers, and the Chris Paul-led Charlotte Hornets have all impressed. Dallas, Detroit, Phoenix are beginning to wane. I’d say that about the Spurs but I know better. The Celtics are being tested. Lebron James and the Cavaliers nursed injuries all season long and only won 45 games. But the Cavs are built for the playoffs, not the regular season, and they are proving it. Like the Spurs, they’re a seven-game series team. The regular season is only a snapshot of NBA basketball in time. Sometimes the camera lies, and this seems to be one of those seasons. This entry was posted in NBA Playoffs and tagged Boston Celtics, Denver Nuggets, Doc Rivers, George Karl, NBA Playoffs, Ray Allen, Sam Cassell on April 29, 2008 by J.D. Mo.